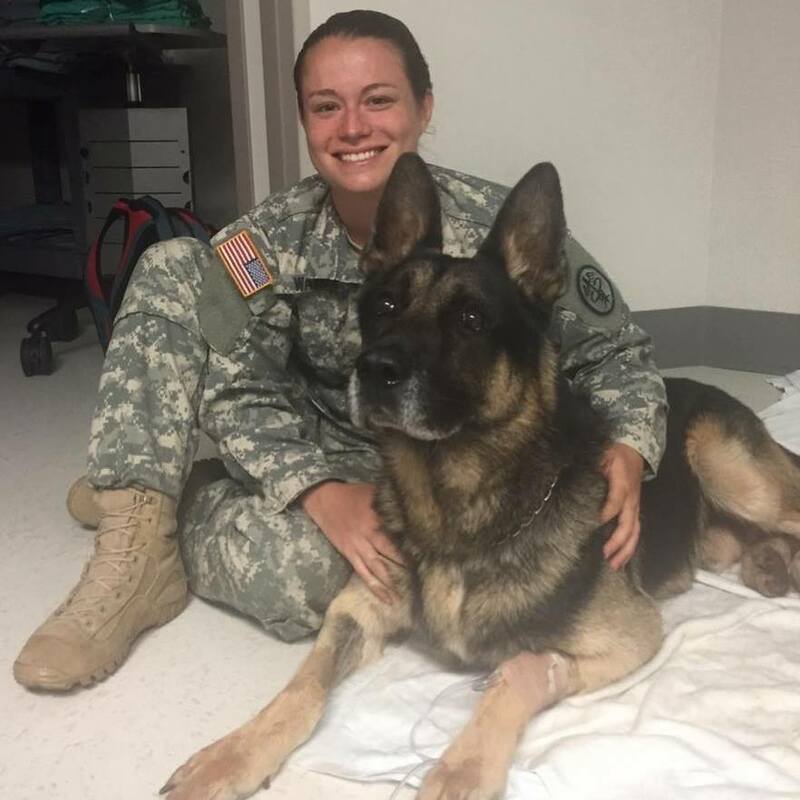 The College of Veterinary Medicine Class of 2017 spent Spring Break different than their undergraduate colleagues – starting their journey of gaining real-world experience in their chosen disciplines under the supervision of veterinarians around the U.S.
Samantha Warner and a military working dog. The eight-week preceptorship allows students to apply what they have learned in classrooms, laboratories, and clinical rotations. The 121-students in the class have chosen a variety of specializations. While 30 students will be gaining professional experience in Alabama and 30 in Kentucky, others will complete preceptorships in more distant locations. For instance, Samantha Warner is at the Holland Military Working Dog Hospital at Lackland Air Force Base in San Antonio, Texas. The Holland Military Working Dog Hospital is a referral center providing primary and specialty level care as well as worldwide referral and consultative services for all dogs in Department of Defense Military Working Dog programs and those of other federal agencies such as the Transportation Security Administration dogs undergoing training. “I hope to learn how to provide medical care for these amazing dogs while making the experience as stress free as possible for both the canines and their handlers,” said Warner, who is a member of the U.S. Army Veterinary Corps, and will be participating in a one-year internship with the Army at Ft. Benning, Ga., following graduation, before being stationed as a veterinarian. Katie Xu Sedlaczek and Zoe. 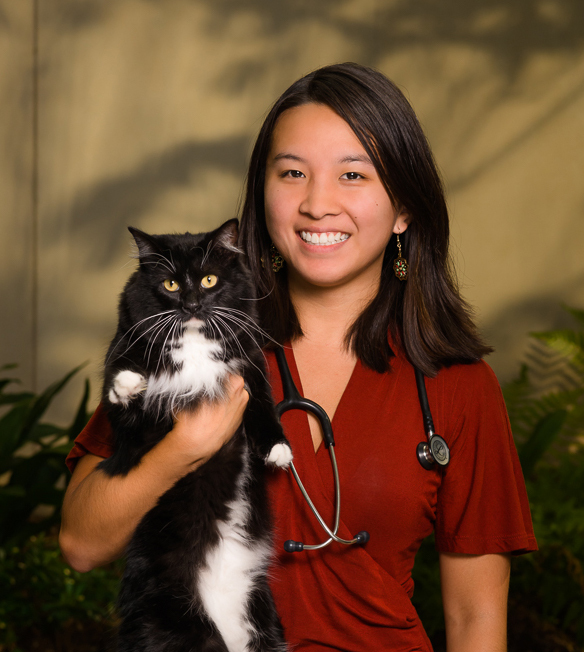 Katie Xu Sedlaczek calls herself a “certified cat lady.” She adopted three cats while in college, and her preceptorship is at the Lexington (Ky.) Hospital for Cats — a cat-only practice. “I was familiar with the cat hospital from my time in undergrad at UK, and felt that a preceptorship there would be a great way for me to get the feline knowledge I was looking for while returning to Lexington. Students are required to choose a hosting practice that is at least 30 miles away from the Auburn campus. Practices undergo a rigorous evaluation process before they are approved to host a preceptor student. Applications are reviewed by a committee to ensure that they meet the high standards of practice that the CVM requires. Once accepted, practices can continue to host students for four years before repeating the application process. The college also strives to ensure that the experiences students gain during the preceptorship impacts the future direction of the college. Following the preceptorship, students spend a day debriefing, discussing all of their prior educational experiences, including their preceptorship. 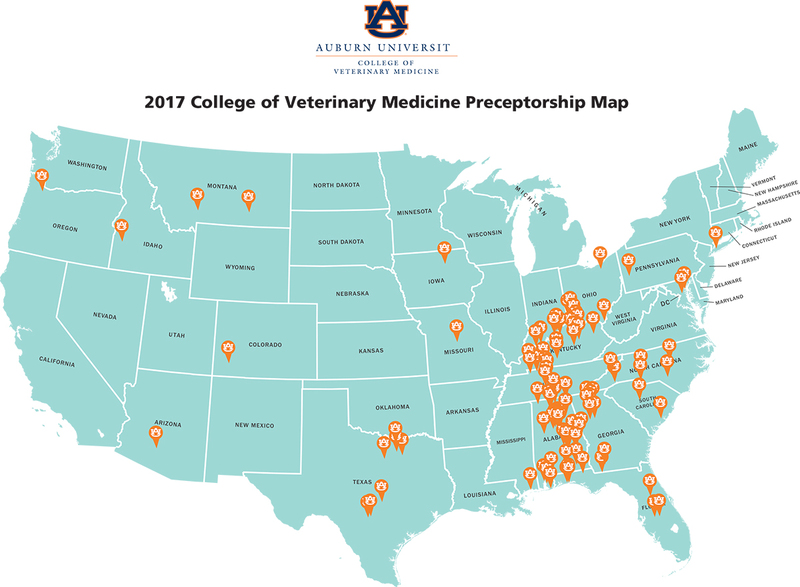 Fourth-year veterinarian students are across the U.S. taking their preceptorship before graduation. The Class of 2017 completes preceptorships in early May. After the successful completion of the preceptorship and debriefing, the senior class will participate in commencement ceremonies on Tuesday, May 9, in Auburn Arena.